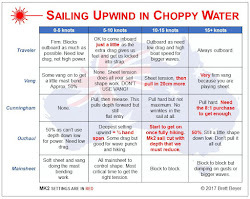 Improper Course: The High Price of Making Sailing a Spectator Sport? The High Price of Making Sailing a Spectator Sport? When I was living in Sydney in the early 70's, I had the good fortune of helping Frank Bethwaite with some of his wind tunnel testing for the Little America's Cup. The boats for this event were large catamarans with an open sail plan. Frank's design was radical at the time - to have solid wings instead of sails. He would set up different configurations and fire up his wind tunnel and I'd sit under it to record the caliper readings for both lift and drag. It was fascinating to watch Frank at work. He was much more interested in the lift readings than the drag readings and was constantly looking for more lift. He did not bother testing a single wing configuration but instead focused on how two would best work together. I never understood this and assumed he knew this from his piloting days - how the extended flaps on a landing aircraft are actually two wings working together when maximum lift is needed. 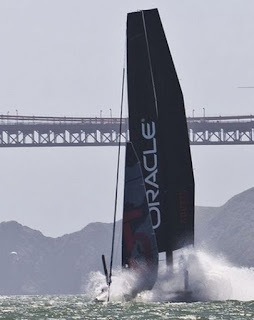 Frank's designs were never used in the Little America's Cup, but it will surprise no one who knew him that his brilliant designs from 40 years ago are the same as the computer-aided designs being used on today's AC42s and AC72s. When we saw Frank in Sydney just before his passing last year, it was fascinating to talk about how his designs have held up and evolved over all these years. One question I had was about the current AC hull designs - they did not seem stable enough to manage the force of the wing sails and were burying and pitch-poling. This was especially true when bearing off from the weather mark when the rig powers up before the boat has had a chance to accelerate. The result is like putting a V8 on a tricycle. I asked Frank if he thought the hull design was intentionally narrow and unstable so that there would be wipe-outs to make the AC sailing more of a spectator sport. He thought for a moment and then said "yes." I'm not a designer, but even I can think of a way to make the bow less likely to bury without affecting its wave-cutting ability and speed. And I know that Frank would never have designed a hull that was intentionally unstable. Pam and I join all sailors who mourn the tragic loss of loss of Bart Simpson. 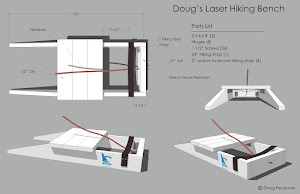 We sincerely hope that the hull design is reconsidered so that no one else gets hurt. Hulls intentionally designed for wipe-outs? - emphatically NO! If you can sail a Laser downwind in 20kn then you have the skills to sail an AC45 downwind in 22kn. In stronger winds you need cat-specific experience. In 30kn the very good sailors survive downwind. Many of the early pitchpoles were from sailors who had not built up their experience in smaller cats. 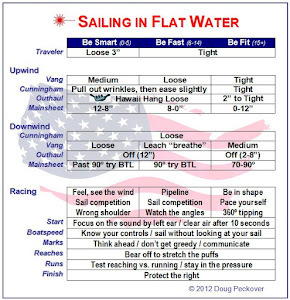 Pitchpoling still occurs in the racing because of the competitive emotions overriding seamanship. We asked Julian Bethwaite for his thoughts which he shared but he would not allow us to quote him. Wise man! My crude understanding is that there is some amount of merit in both M and Doug's perspectives. And that's really the purpose of the blog. To hear different perspectives. We have nothing but respect for the skills of the sailors that sail at this level. 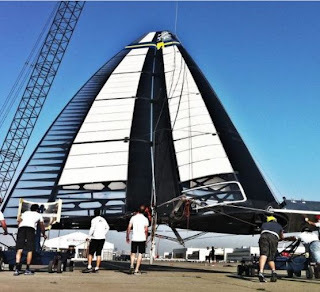 I just can't understand why anyone would spend millions of dollars on a boat that cannot sustain a capsize, not to mention the potential dangers to its sailors. That seems like a waste of money. I would love to see the same camera work, commentary and miked sailors but on monohulls since that is closer to something I can relate to.